WASHINGTON, D.C. -- Nearly half of U.S. states saw their well-being scores decline by a statistically significant margin in 2017, according to the Gallup-Sharecare Well-Being Index. And, for the first time in nine years of tracking changes in state well-being, no state saw statistically significant improvement from the year before. 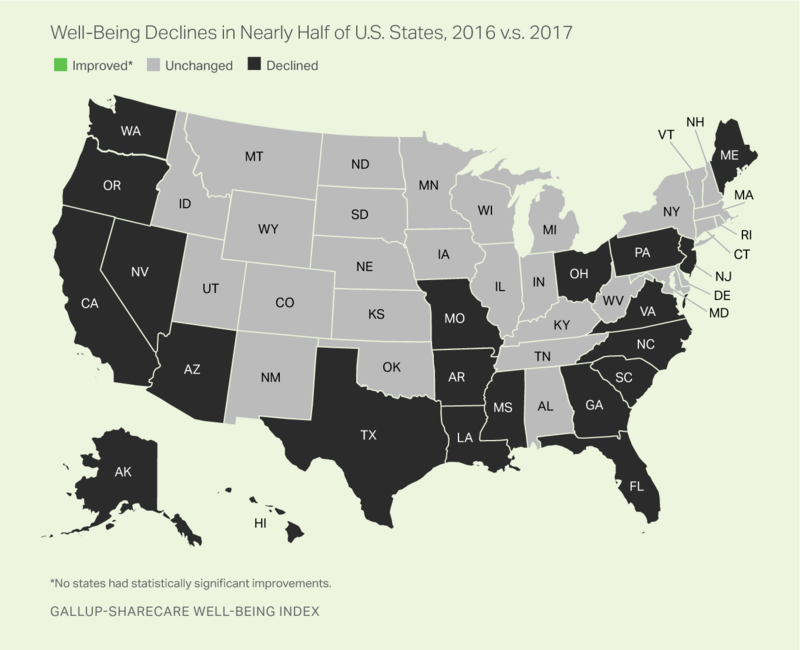 The 21 U.S. states that saw their well-being drop in 2017 shattered the previous record set in 2009 amidst the Great Recession, when 15 states had lower well-being than the year before. The large number of states with declines in well-being in 2017 is particularly notable given that Americans' confidence in the economy and perceptions of the job market are substantially better in 2017 than they were in 2009. For the nation as a whole, the Well-Being Index score for the U.S. in 2017 was 61.5, a decline from 62.1 in 2016 and the largest year-over-year decline since the index began in 2008. A sharp uptick in reporting "little interest or pleasure in doing things"
A decline in having "someone who encourages you to be healthy"
A drop in reports of liking "what you do each day"
A decrease in those who have a leader in their life who makes them "enthusiastic about the future"
The declines in well-being were mostly driven by drops in metrics comprising purpose and social well-being, as well as the mental health aspects of physical well-being rather than community well-being or traditional facets of physical health such as obesity, exercise or smoking. 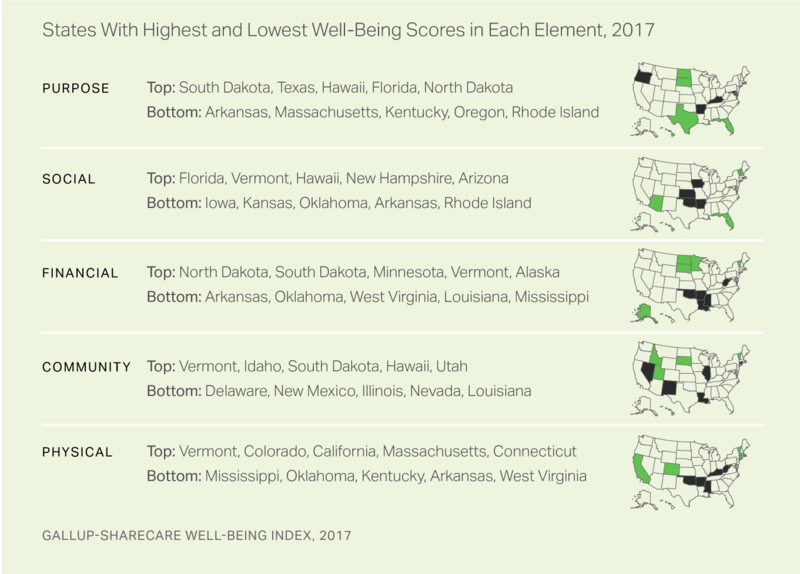 Against the backdrop of deteriorating well-being nationally, South Dakota and Vermont led the nation in well-being for the first time in 2017, with Well-Being Index scores of 64.1. These scores were statistically unchanged from 2016, providing them an advantage in the rankings given broad declines elsewhere. Hawaii, which has had the highest well-being six of the previous nine years, finished 2017 with the third-highest-score. South Dakota is no stranger to high well-being. It had the second highest Well-Being Index score in the U.S. in 2013 and has been among the six highest well-being states every year since. Vermont, which had the sixth highest well-being score in 2016, rose to its highest rank over the ten-year history of the Well-Being Index. Hawaii and Colorado are the only two states that have made the list of the 10 highest well-being states each year since 2008. Montana and Minnesota have been among the highest 10 each year except for 2010 and 2014, respectively. Florida, Texas and California have in recent years consistently placed just outside of the highest 10. Most of the lowest well-being states have frequented this list in the past. West Virginia, in particular, has had the lowest well-being in the nation for nine consecutive years while Louisiana -- typically on the high end of the lowest quintile -- finished in its lowest position ever. In most cases, a difference of 0.5 to 1.0 points in the Well-Being Index score between any two states represents a statistically significant gap, and is characterized by meaningfully large differences in at least some of the individual metrics that make up the overall Gallup-Sharecare Well-Being Index. Vermont and South Dakota's strong performance in individual elements of well-being drove their first place finishes. Vermont ranked among the top four states in community, physical, social and financial well-being. South Dakota had the best purpose well-being in 2017 and also ranked among the top three in financial and community well-being. Hawaii was among the top four states in purpose, social and community well-being. Florida led the pack on social well-being, while North Dakota finished first on financial well-being. The steep decline in well-being nationally in 2017 is reflected at the state level. This is a trend state and business leaders should monitor because Gallup and Sharecare research has shown that workers with higher well-being are significantly less likely to experience unplanned absenteeism, perform better while at work and have lower healthcare utilization than their counterparts. Having high well-being across all five elements, in turn, results in individuals who are less likely to change employers voluntarily, file fewer worker compensation claims and are more resilient in the face of challenges such as layoffs or natural catastrophes than are those who are physically fit alone. People with higher well-being across the elements are better able to take care of their own basic needs, adapt readily to change and feel better able to contribute to and support the success of their organizations and communities. Drops in well-being, therefore, increase the liability in each of these areas for the states that suffer them and should command the attention of their leaders, as weakening well-being can result in slowing the pace of an otherwise improving economy. State leaders should monitor their well-being score and develop specific strategies to improve it. State and community leaders can study and adopt best practices from states with consistently high well-being scores such as Hawaii, South Dakota and Vermont in order to maximize the chances that their own constituents are best able to lead a life well lived. View the complete state results in Sharecare's report, State of American Well-Being: 2017 State Well-Being Rankings. Results are based on telephone interviews conducted Jan. 2-Dec. 30, 2017, as a part of the Gallup-Sharecare Well-Being Index, with a random sample of 160,498 adults, aged 18 and older, living in all 50 U.S. states and the District of Columbia. For results based on the total sample of national adults, the margin of sampling error for the Well-Being Index score is ±0.15 points at the 95% confidence level. The margin of sampling error for most states is about ±0.6 points, although this increases to about ±1.6 points for the smallest population states such as North Dakota, Wyoming, Hawaii and Delaware. All reported margins of sampling error include computed design effects due to weighting. Statistical change testing is based at the 90% (p<.10) confidence level and includes design effect for more conservative results that incorporate the imperfectness of the randomness of the state samples. Set your workplace apart with a culture of well-being. Let Gallup show you how to make well-being a differentiator for your business. The success of any well-being initiative hinges on manager support and involvement. Employees who frequently have the opportunity to do what they do best are more productive, happier and healthier. Financial inclusion -- savings services, in particular -- may help battle food insecurity, according to the Food and Agriculture Organization of the U.N.